Above is the astrological chart for our meditation, which shows a powerful Grand Square between Moon and Lunar node conjunct, opposing Sun and Mercury, and squaring Uranus, Eris and Pallas. Multiple planets in this chart are making numerous powerful aspects (around 20 aspects in total!) with the Galactic Center, Pleiades and Sirius. This powerful configuration creates a point of maximum tension which is released in a big cosmic breakthrough. We will be doing this meditation at the moment of the maximum of the Lunar eclipse on Monday, January 21th at 00:11 am EST in New York. This equals 2:11 pm JST in Tokyo, 1:11 pm CST in Taipei and Beijing, 7:11 am EET in Cairo, 6:11 am CET in Paris, 5:11 am GMT in London. Central and western part of US will still have Sunday, January 20th , the timing will be: 11:11 pm CST in Chicago,10:11 pm MST in Denver and 9:11 pm PST in Los Angeles. 8. While doing that, start singing mantra eeeaaa (eee is pronounced as e in “America” and NOT as e in “Venus”, and a is pronounced as a in “America”) so that it vibrates through your body and visualize a rainbow vortex of Light expanding from your heart outwards throughout the whole planet. Suggested time for our meditation is 20 minutes. Modern man – the smooth savage with a lonely heart living in high rise ‘smart’ cities of concrete and glass…. forced to live by the clock in a bubble of busy business, and compelled by the status quo to try and be top dog in a dog eat dog world. Gone is the wonder of childhood- lost is ‘sacred sympathy’, the flower of imaginative intuition and the innocence of thought that we experienced in the magical time when we were still connected to the All, and not yet corrupted by the descent into matter – into 3D density and the world of materialism, intellect and ego. The acute development of our intellect and emphasis on achievement has been realised at a terrible price. Material success has robbed us of our connection and perception of the energetic ‘other-worlds’ which exist all around us. We can no longer unite with the spiritual beings that vitalise form; no longer connect with the faerie realms, and have turned our backs upon our divine connection to all life – the seen and unseen, and in so doing we have lost touch with our true selves. We are only half alive. Some of us never lose our childhood wonder and through all the struggles and turmoils of our lives manage to keep the magic alive. We seek out the ageless wisdom of connection…. forever aspiring to comprehend and blend with the whole. We become dreamers and poets, explorers of frequencies and subtler systems of being. And, if our hearts are true, spiritual synchronicity becomes active in our lives. I was brought up in the Celtic tradition and seances/spirit callings were part of my life. 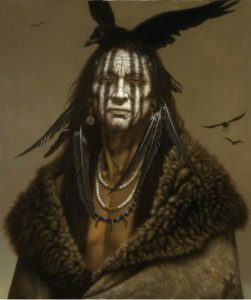 Later, when I came to America, I was introduced to Lakota thought and philosophy which answered the questions I had about the nature of elementals, nature spirits, demons and feys. Lakota shaman tell us that there is a mysterious power that vitalises life – a field of unified energies and forces which create an infinite diversity of form, and holds together the particles of all manifested objects and beings in the material world. There are five of these invisible bands of moving power: stone(solid) water (fluid) fire(heat) air(gas) and space that surrounds us. Our five fingers and five toes are sensors for the building blocks of our reality – the magical force of five. The medecine wheel – the cangleshka wakan of the Lakota is a sacred symbol found in many aboriginal cultures. It is the power of five, the four elements and the space that surrounds them. In my understanding it is the two dimensional blueprint of our reality. The Lakota say: “The life of a man is two roads and he can choose which road he walks.” – the black east/west road of suffering where the heart(4th chakra of air) is at war with the west (the 2nd chakra of water – emotions) or the north/south road of earth(first chakra) and fire(third chakra) – the spirit road. At the centre of the cross roads, the tree of life blooms(awareness) and the hoop(circle) of all living nations is formed. When we were tribal people, living with nature and free of the stresses and restraints of modern life, we could see into the invisible realms and communicate with spiritual reality. Shaman were aware that just as the material world is dual, and by that I mean a love/hate polarity, the spiritual realms were populated by good and bad spirits. The negative creatures are known as wakan sica – bad medecine and in my tradition they are called the Unseelie Court of Faerie. Sage, sweet grass, cedar, scabious root, agrimony, lavender flowers, and other high frequency plants are burnt in an effort to dispel negative ‘spirits and thought forms’ from ceremonies, homes and other dwellings. Our visible world is populated by a diversity of beings: mammal, birds, fish, reptiles, plants etc, and the same rule applies to the invisible, spiritual counterpart of our material world. The unseen side of our reality is inhabited by hosts of beings called elementals – spirits that are electro-magnetically attached to the Skan fields of earth, water, fire, air and space. The elemental cosmic forces interpenetrate the earth, and the inhabitants of these hidden realms are aware of us, even though we are not aware of them. Elementals and other spirits vibrate outside of visible light so we can’t see them – but they can look into our world at anytime they like. They are drawn to our emotional state by resonance. Love, gratitude and joy attract the’ good guys’, hate, violence and perverted sexual energy attract the bad. At this moment, faerie beings could be standing right in front of us – sitting in the same chair, and we don’t have a clue there’s anything there. Sometimes even though we can’t see these invisible beings, we can sense their presence. We may see a fleeting glimpse of movement on the periphery of our vision, or the feeling that ‘something’ is with us in the room…watching us. A creeping chill at the back of our neck when we enter an old house, ruins or cemetery, and the sudden disappearance of an item that we’re using, only to have it reappear in a place we know we didn’t put it. The elementals attached to the five bands of moving power have their own phonetics, colours, perfumes and geometrics pertaining to their element. These pass-gates were known to the shamans of the past but with the destruction of indigenous people and their earth based cultures, the sacred knowledge and language was lost. In today’s world there are few people left who know how to contact the energies of spiritual reality. I think the destruction of tribal people and their sacred knowledge was a deliberate act on the part of a very negative power to close down our awareness and block us from the sacred side of our dualistic nature. We have now been spiritually neutered and instead of being able to walk in many worlds we have been confined to one. There have been hundreds of thousands of pages written about the faeries of our folklore and traditions. We know their form, characteristics, caprices, tribes and lineage, but in my experience with elementals, I have found that they are electro-magnetic wave patterns. They have no material shape and can appear to human perception in any form they want, but normally one that is immediately recognisable to the viewer. In Lakota country an earth elemental appears as a small wizened man with braids dressed in buckskin, and the hooved and horned fauns that live in trees are called Can-o-ti-la. The people of the wood. The plane we call home has become the abode of devils. Billions of sentient lifeforms are butchered every day for their flesh while countless others are hunted for sport, trapped, tortured, caged and murdered for so called science, by soulless beings that masquerade as men. Millions of innocent people are maimed, murdered and displaced by power crazed demons fighting over ever dwindling resources – earth is being used up. My Heartstar Series of books: The Key made of Air – the Gates to Pandemonia and Walking in Three Worlds are a multi-dimensional mirror of the tragedy that is happening in our dimension and how it affects the elemental worlds and higher planes of being. Excerpt from Book three: Walking in Three Worlds. Long ago in the mists of time, the realms of Humanity, Faerie, and High Faerie were all one world, with the sentient creatures of all three realms living in harmony with each other. But evil entered the world of humankind. The Cathac, the great horned serpent from the stars, insinuated his thoughts of conquest into the dreams of chieftains, filling them with pride, a lust for war, and murderous intent. When the stars aligned and formed a glittering pentagon in the sky, the Cathac had attacked the triad world of Faerie. Long and bloody was the battle. The Cathac had druid sorcerers in his ranks. With dark spells, he ripped the world of Humanity away from Faerie and made its inhabitants mortal. According to Irish Mythology the Cathac or Cata, a gigantic flesh eating sea serpent was vanquished by St Senan in 534 AD. A carving depicting the Cathac is in the old chapel of Kilrush in County Clare. The head of the Cathac can be seen in the first outcropping and other faces can be seen in the Cliffs of Moher which in my novels are called the Gates to Pandemonia. In Book three of my HeartStar Series: Walking in Three Worlds we find a different account of the vanquishing of the Cathac, and we are told how the Cliffs of Moher were formed by the giants Finn McCoul and his brother Uall McCarn. As night fell, Uall had heard rumbling and the beating of great wings in the sky. In plumes of fire and smoke, he had seen Braxach arrive at the Giant’s Cliffs with Duir, the father of dwarves, riding on his back. They had been pursuing the legions of devils and demons that had followed the Cathac in his murderous rampage along the coast. The dragon had settled on the beach and given them a fiery snort of greeting. Duir slid off his back. As Braxach took to the air once more, the dwarf king had told Uall and Finn of his and Braxach’s plan to trap the Cathac, saying that he needed the giants’ help to do it. The sea had been calm and shadowy under a fitful moon as they waited in the darkness for the Cathac to attack. The air grew cold, and then with a churning of the waters, the Cathac had raised its horned head and, coiling its gargantuan bulk, struck at them with gaping jaws. As the Cathac attacked, Braxach had sent a blast of fire into the monster’s eyes. The giants had ripped up the rock and earth in front of them, forming a great wall thousands of feet high. Blinded, the Cathac did not see the upraised cliff and slammed into the rock face. Duir was waiting. Once the Cathac’s body had made contact with the stone, Duir had called out to the burning lakes of liquid fire deep beneath the earth for aid. With his hands, the dwarf sire had woven a stone spell of molten lava and then cast the magma stream around the monster. Singing in the language of the stone,he had hardened the burning liquid into rock, trapping the Cathac within a sarcophagus of enchanted stone. There has been a lot of energy changes/ upgrades for all these last few weeks, I have been so busy with clients and writing my daily energy reports, and dealing with the upgrades, I have barely had time to keep up with all of them. Yet it is very important for everyone to be aware and have their consciousness uplifted by the energy that is changing and initiating light body activations in the Ascension process. About 5 times or more I have felt shifts coming in where I would feel a shift come through my body, this then manifests into a dizzy spell and I feel like I am going to fall off my chair. This lasts about 15 minutes and then is gone. We have also been experiencing bouts of nausea, fatigue, sleep issues, and vivid dreams are back again. There has also been a feeling of unease, as if we don’t know what to do with ourselves. This came in about 1 week ago and is still here. As an energy expert I notice all the very small things others may pass by not thinking anything about them. Yet many experience ascension symptoms at the same time in the ascension process and no matter how small they are, all important and point to our acceleration and building of the light body. Many geomagnetic storms and increased solar wind have taken place the last few weeks but they have only usually lasted a day, I didn’t feel they were long lasting enough to write a report on. These will always bring in more DNA changes to the light body. Many who have been in 3D have been reporting to me they are now experiencing the shift. This is the first time since I have been reporting on the energies (since 2010), I have had so many people that are not in the spiritual community start to come to me with their other dimensional experiences (this means out of this realm). Most of them have been seeing things from other dimensions or having full blown experiences of shifting timelines. This is a very important fact because for the first time, it is showing how the light is affecting everyone. Time has sped up again. Days are going by faster and faster and the feeling is there is not enough time to get everything done. This is an indiction of frequency increases as we will all vibrate faster once the shift is complete. I know this from my own Near Ascension Experience in 2013 where I almost completed ascended and stopped at the last minute. For the next 2 weeks after the experience I was vibrating so fast , everyone here seemed in slow motion. It is not easy to exist in the higher realms and here at the same time. This is what happens I tune into those who have passed, they have a very high, and fast vibration. This is all documented on my you tube channel for anyone who would like to hear what it was like. It has been reported that Billy Graham died last week. This is a Mandela effect person as I know he has died ten times for me, once each year for the past ten years at least. If you do not remember Billy Graham or the many other celebrities who have already passed on, try to remember the memory this time because it will happen again. If you can hang onto this memory, this shows you are able to retain your own reality and are not being affected by the changing timelines. If you watched some of my past interviews you would have seen me talk about the Mandela effect and go into some detail. A longer article though I feel is needed again to upgrade everyone on what is going on. The goal is even with the Mandela Effect, we want to be the masters of our own realities and frequencies. We want to have the memory of what has happened in the past and not have it be erased by a new timeline. I have been the master of my own reality for many years now. This is how I am able to remember the shifting Mandela effect timelines. Everyone can do this and everyone will want to do this with help anchoring in to the New Earth. The dark that has been in charge are feeling pushed against the wall, as much of the population continues to awaken and hold more light. The more that awaken, the more can awaken. This is why it is so important to work on your own awakening first. Until I reached the mastery level of my own frequency many years ago, I was too busy working on myself to help anyone else, now I help others to attain the same awareness. The dark forces are being pushed by our awakening, so this is even more impetus to work day and night on awakening even further. In my own journey, years ago, this is exactly what I did. I manifested a situation that was perfect for me so I could only work on my own evolvement. Everyone has the capability to do this. We can all create and manifest what will work best for us to evolve. The goal is to be able to put as much time as possible now into evolving past 3D mindsets. This is where we see the TRUTH of all things and see beyond the dark agendas. As we see the dark forces push back, we can smile and know they have less and less to feed on. Since lower vibrations is what they live on, we must always be sure and stay out of these lower vibrational realms. This is fear, depression, sadness and negativity. The spiritual community must work very hard now to keep the vibration high as we are in the final stretch with the dark forces. The higher we shine, the more they do not exist for us. Many relationships have been having issues as many struggle to present their higher selves to the world and their partner. This means tapping into our authentic selves and many are in the process of this right now. As more light is held, there is more pressure to become the authentic self. Compassion towards our partners in their journey must be given as they go through this process because it is not an easy one. Relationships now will move forward or break apart but with both searching for who they really are and what their place is in the New Earth. As the light continues to build and create the light body, we will see more and more things in the sky and earth we have not seen before. Pay attention to the MSM because they will say it has been around forever but remember we are entering new realities all the time now. The best timeline is being chosen now with inter dimension Earth shining through for all of us to see and witness. Many ask me who will go to the New Earth. My answer is all humans will go. I was told this about a year ago by the higher realms. They have never been wrong. All humans will have a chance to raise their frequencies high enough to create the New Earth and be a part of this fantastic process we are going through. We are right now in the middle of this creation. We are right now going through the intense process of light body activations which leads to our new reality and dimension. The way things will unfold will not be how many are saying yet it will make sense to everyone as the time comes. We are in the most important time right now because the New Earth is being formed right now as darkness is being extinguished. Do not look to the future but be in the NOW moment when everything is taking place!